A new Instrument for the Rapid and Accurate Determination of the Viscous Properties of Newtonian and Non-Newtonian Fluids at High Temperature. 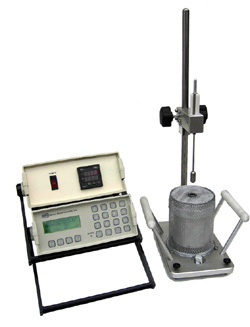 The High Temperature Viscometer consists of a support stand with an electric heater and a sample tube filled with the liquid whose viscosity is to be determined. Viscosity of the sample is determined by measuring the falling time of a controlled needle through a predetermined distance of the fluid held in a sample tube. The falling time is measured automatically by means of Hall sensors and a magnet in the weight holder. For Non-Newtonian fluid, a computer program is available from SBS. *Outside this range, consult SBS. **With a constant temperature circulator.